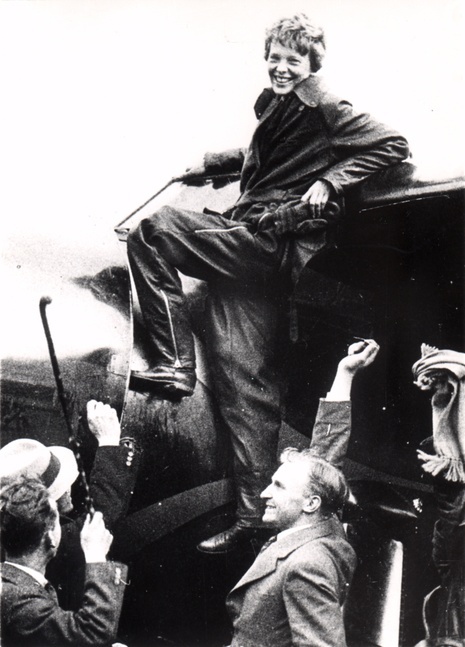 On May 20-21, 1932, Earhart accomplished her goal of flying solo across the Atlantic Ocean. She took off from Newfoundland, Canada, at 7:12 p.m. on May 20, in her Lockheed Vega. Her flight was filled with dangers, from rapidly changing weather to a broken altimeter so she could not tell how high she was flying, to gasoline leaking into the cockpit. At one point her plane dropped almost 3,000 feet (914 meters) and went into a spin (which she managed to pull out of) and flames were shooting out of the exhaust manifold. She brought her plane down on the coast of Ireland after a harrowing trip lasting 15 hours and 18 minutes The flight was the second solo flight across the Atlantic and the longest nonstop flight by a woman--2,026 miles (3,261 kilometers)--as well as the first flight across the Atlantic by a woman. 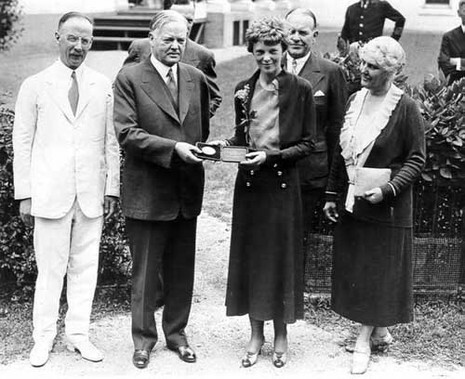 President Herbert Hoover awarded her the National Geographic Society Medal on June 21, 1932, for her achievement, and the U.S. Congress awarded her the Distinguished Flying Cross, the first woman to receive such an honor. Earhart's accomplishment meant a great deal to the entire world, but especially to women, for it demonstrated that women could set their own course in aviation and other fields. At the age of 34, on the morning of May 20, 1932 Earhart set off from Harbour Grace, Newfoundland with the latest copy of a local newspaper (the dated copy was intended to confirm the date of the flight). She intended to fly to Paris in her single engine Lockheed Vega 5b to emulate Charles Lindbergh's solo flight. Her technical advisor for the flight was famed Norwegian American aviator Bernt Balchen who helped prepare her aircraft. He also played the role of "decoy" for the press as he was ostensibly preparing Earhart's Vega for his own Arctic flight. After a flight lasting 14 hours, 56 minutes during which she contended with strong northerly winds, icy conditions and mechanical problems, Earhart landed in a pasture at Culmore, north of Derry, Northern Ireland. The landing was witnessed by Cecil King and T. Sawyer. When a farm hand asked, "Have you flown far?" Amelia replied, "From America. "The site now is the home of a small museum, the Amelia Earhart Centre. As the first woman to fly solo non-stop across the Atlantic, Earhart received the Distinguished Flying Cross from Congress, the Cross of Knight of the Legion of Honor from the French Government and the Gold Medal of the National Geographic Society from President Herbert Hoover. As her fame grew, she developed friendships with many people in high offices, most notably, Eleanor Roosevelt, the First Lady from 1933–1945. Roosevelt shared many of Earhart's interests and passions, especially women's causes. After flying with Earhart, Roosevelt actually obtained a student permit but did not pursue her plans to learn to fly. The two friends communicated frequently throughout their lives. Another famous flyer, Jacqueline Cochran, who the public considered Amelia's greatest rival, also became a confidante and friend during this period. By early 1932 no other person had successfully flown solo across the Atlantic since Lindbergh. Amelia would not duplicate Lindbergh's course but would fly from Harbour Grace, Newfoundland with the British Isles as her destination. 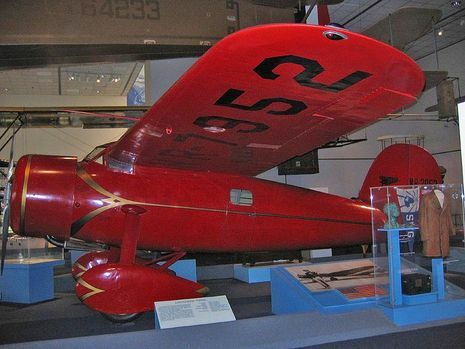 On May 20, 1932, exactly 5 years after the Lindbergh flight, Amelia's modified Lockheed Vega began the journey. Since she did not drink coffee or tea, she would keep awake by using smelling salts on long trips. Amelia prided herself on traveling light...a thermos of soup and a can of tomato juice would sustain her. "Where am I? "...the man replied "in Gallegher's pasture...have you come far?"... "from America", she replied. She had broken several records on this flight...the first woman to fly the Atlantic solo and only person to fly it twice...the longest non-stop distance flown by a woman...and a record for crossing in the shortest time. "So I accept these awards on behalf of the cake bakers and all of those other women who can do some things quite as important, if not more important, than flying, as well as in the name of women flying today."